Pet airline travel may reach new heights in 2009 with the launch of a pet friendly airline called, Pet Airways. This will be a significant change for pet travelers and a relief for many pet owners. According to the American Animal Hospital Association, approximately 76 million cats and dogs travel with their owners each year. Pet travel is on the increase and in response to that demand more and more airlines are allegedly becoming pet friendly. But pet friendly is not always what you think. For instance, despite the high number of pets that are traveling with their owners, relatively few currently travel by air. •	Small pets may travel with their owners only if stowed under the seat. 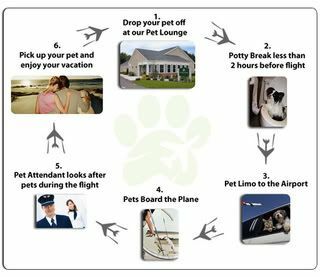 •	Most airlines will only accept one or two pets per flight so if you don’t book early your pet might not be one of those animals. •	Pets too big to fit under the seat are relegated to cargo and are treated as such. •	Cargo pet travel is not available when outside temperatures are below 45 degrees or above 85 degrees. •	Due to the lack of oxygen and temperature control in cargo holds, the most common causes of death to pets transported that way are suffocation and heat prostration. •	Several airlines (including Southwest, USA Air and America West) have announced they will no longer accept pets on board their aircraft. So pet friendly isn’t exactly the phrase I would use for most commercial airlines. I hate to even tell you that out of the two million animals transported in the cargo holds of commercial airliners each year, the Society for the Protection of Companion Animals (SPCA) estimates that approximately 5,000 are injured in transit. So, if you are like me, you are glad to hear that there is going to be another airline option available to pet owners by the summer of 2009. Pet Airways will be in operation and offer its “pawsengers” comfortable and efficient transportation inside the cabins of their planes. Pet Airways (PAWS) will also be the first scheduled airline specifically designed to transport pet passengers who will travel in the specially equipped main cabin of their planes instead of the cargo hold. The Pet Airways currently maintains a fleet of 20 planes including a Falcon 20, Convair 580 and 5800 and B- 727-100 aircraft. The planes meet the FAA requirements for certification as outlined in Part 121 and Part 135 of the Federal Aviation Administration. As for pet comfort, the plane cabins will be fully lit, climate controlled and pressurized and include a trained pet attendant who will be on duty at all times. A typical pet friendly flight will depart with 100 pets. Initial routes are round trip flights from New York to Los Angeles with stops in Washington DC, Chicago and Denver. Pet Airways plans to offer nationwide coverage and easily accessible check-in lounges in major metropolitan areas. The group will also offer flights out of more convenient and less congested secondary airports which will allow for easier access and quicker loading and unloading. Trained personnel will assist “pawsengers” onto their planes and supervise them as they disembark. The goal is to get animals into and out of the planes as quickly as possible, and depending on transit time, offer toileting opportunities, along with food and water as necessary during stops. Pet Airways goal is to provide sensitive, careful handling and peace of mind to all pet parents using the service. The unique animal airline has also developed a proprietary reservation and tracking system called Pawprints™, which will allow pet parents to make reservations and track their pet’s travel via the web. It is too early to tell but estimates are that this service will only cost slightly more than it would if you sent your pet in the cargo hold of other airlines. The goal is to keep the service affordable so all pets can be safe and treated well. Fares will vary according to the size of the pet and the distance traveled. Preliminary estimates are that the rates may start as low at $150 per animal. Pet Airways has also started a furry flyer bonus program called the MyPAWS Club. For just a small membership fee all MyPAWS club members can get discounts off purchases of pet supplies, pet medicines, pet health insurance, pet-friendly hotel stays, pet foods, and more. Pet Airways is now accepting reservations for it first flights and I will be interested to see how this new venture goes. For more information visit Pet Airways. JetBlue Airways recently unveiled JetPaws–a program being marketed as an exclusive new in-cabin program that is designed to provide pet owners with helpful travel guidelines and rules for jetting with small dogs and cats. As part of the new program, customers will receive two bonus award points for each flight through JetBlue’s TrueBlue customer loyalty program. The idea behind this is that it may benefit human customers since they will earn free travel faster when traveling with Fido or Fluffy. The group is giving away a Pet Travel Guide along with a Pet Travel Checklist. I’ve seen better information online but it is still early in the program and I imagine they will add more to these products in the future. As part of this new program, JetBlue has partnered with Cindy Adams, a New York Post columnist, who incidentally has designed a pet carrier kit. There is also a pet travel kit which includes a pet blanket, rubber bone and travel dish. Both are available for sale online. An estimated 80,000 pets travel on JetBlue each year and the JetPaws program is designed to make traveling with pets a smoother experience. Other JetPaws program elements include a special welcome email for pet owners within one week of their booking and complimentary access to the downloadable e-booklets (links above) highlighting pet-friendly hotels, restaurants, parks and animal hospitals in some of JetBlue’s top cities, including: Boston; Fort Lauderdale; Las Vegas; Long Beach/L.A. ; New York; Orlando; San Francisco; and Washington, D.C.
One of the reasons I thought I would mention this new program is that until December 30, 2008 you can participate in the JetBlue Pet Look-Alike photo contest. To enter just email the photo to jetpaws@jetblue.com. Some restrictions apply so click here for official rules or to enter online. Only one photo per email address may be submitted and be sure to include your first and last name along with your pet’s name. JetBlue will post the top submissions during the contest and judging will be done by the airline’s crew members from December 31, 2008 to January 9, 2009. The grand prize winner will receive roundtrip travel for two to any of the airline’s 51 destinations, and four runner-ups will receive a JetPaws Pet Carrier and Pet Travel Kit. Now if you have traveled with pets before you know that pet airline travel is far from ideal. JetBlue accepts up to four small cats or dogs in the cabin of the aircraft on both domestic and international flights. Only one pet is allowed per customer and the pet carrier does count as one personal carry-on item. For the safety and comfort of all customers, pets must remain in the closed carrier at the airport and in-flight for the entire duration of the trip. To book a pet, customers must call the reservations team at 1-800-JETBLUE. In the next part of this series I’ll talk about a new pet airline where pets travel in the cabins of the planes with fewer restrictions than is currently offered from any other carriers.